The Boeing Co. and Lockheed Martin Corp. are teaming to compete for the United States Air Force’s Long-Range Strike Bomber program, with Boeing acting as the prime contractor and Lockheed Martin as the primary teammate. Boeing delivered the 223rd and last U.S. Air Force C-17 Globemaster III airlifter , fulfilling the production contract more than 20 years after the first delivery. With today’s launch of the sixth Wideband Global SATCOM satellite, Boeing and the U.S. Air Force continue to expand the advanced WGS communications network that serves the U.S. Department of Defense and its international partners, including the Australian Defence Force. Boeing and Panasonic Avionics Corp. are preparing to open a new market for Panasonic’s secure, satellite-based, in-flight broadband service known as eXConnect. Under a new agreement, Boeing will offer eXConnect service to government customers within and outside the United States. The Global Positioning System, which millions of people use every day for precise navigation and timing, recently became more accurate and reliable as the fourth Boeing GPS IIF satellite began operating in the U.S. Air Force network. 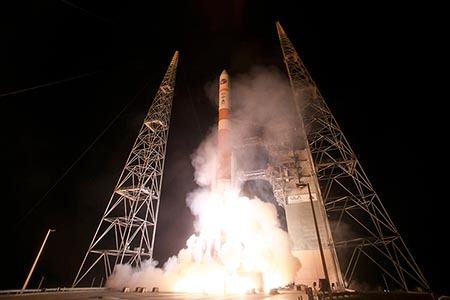 With today’s launch of the fourth GPS IIF satellite, Boeing and the U.S. Air Force continue modernizing the Global Positioning System that millions of people worldwide rely on as a navigation and timing resource. Boeing will build four more 702MP satellites for Intelsat S.A., furthering its role as the initial manufacturer of Intelsat’s new high-performance satellite fleet, Intelsat EpicNG. The 702MPs will deliver reliable, affordable and high-capacity data transmission that Intelsat customers can tailor to their needs. The Boeing Family of Advanced Beyond Line-of-Sight Terminals (FAB-T) wideband communications program has entered a new phase by delivering the first two engineering development models to the U.S. Air Force. Boeing will continue modernizing the Global Positioning System (GPS) satellite constellation for up to five more years, extending the company's role in the vital military and civilian navigation network. Boeing recently achieved two important milestones on the U.S. Air Force Family of Advanced Beyond Line-of-Sight Terminal (FAB-T) program, which will provide protected wideband satellite communications among ground and airborne terminals for the command and control of U.S. nuclear forces.